BLUETOOTH 4.0 and 2.4GHz WIRELESS CONNECTION: With dual mode connection, The Jelly Comb Bluetooth / 2.4GHz wireless mouse can work on TWO DEVICES, connecting one device through Bluetooth and the other through 2.4GHz USB Receiver. You could switch the mode between two devices by just one click. With only one mouse, you can switch free to control two devices, from your desktop to your tablet, laptop to Mac, extremely convenient. HIGH SENSITIVITY and SILENT CLICK: Switch DPI levels among 1000, 1600 and 2400 to meet both ordinary and gaming needs. Advanced Optical Tracking Technology ensures greater sensitivity for precise tracking on a wide range of surfaces. Tested over 5 million times clicks lifespan ensures long-term and stable use. Quieter and Silenter to click, makes you concentrate on your work without disturbing others around you. SLIM and ERGONOMIC DESIGN: With slim ergonomic design and smooth frosted surface, this wireless Bluetooth mouse fits comfortably and perfectly in your hands, providing an incredible user experience. 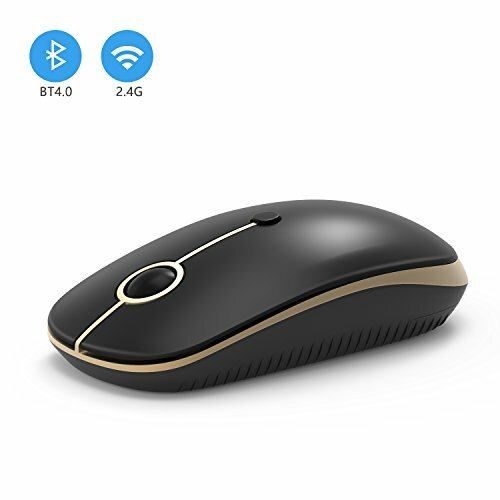 LOW POWER CONSUMPTION: To save power and for long-term usage, the wireless mouse will automatically enter into the sleep mode after 8 minutes of inactivity, it can be waken up by clicking any button. The mouse requires one AA battery (not included in the package).